Calling Artists & Advocates - Apply to Present at the April 27th FEAST! The title of the 2019 Honolulu Biennial is 'TO MAKE WRONG/ RIGHT / NOW', drawn from the poem Manifesto by Native Hawaiian artist and poet Imaikalani Kalahel. In honoring this poem's theme, the Biennial approach has been grounded in a deep reverence for land, ocean, wahi pana (storied places), the genealogical ties within Hawaiʻi and the wider Pacific region. 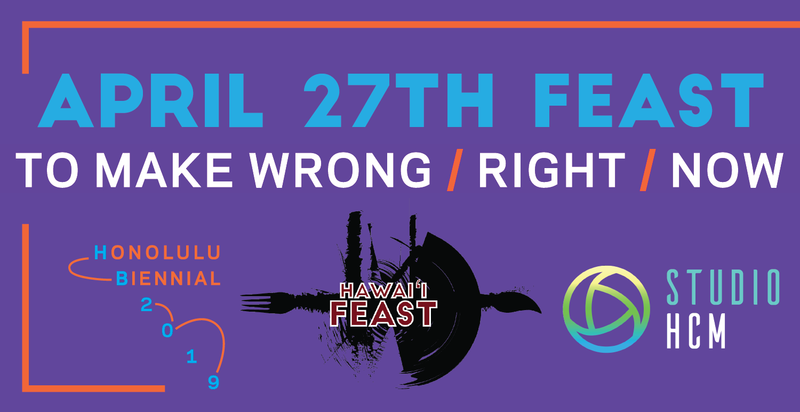 At the April 27th FEAST, we are seeking artists to pitch public art and creative advocacy projects that uplift the Hawaiian and Pacific Islands community and / or bring awareness to the issues faced by these communities. Project mediums can include, but are not limited to: photography, videography, music, written blogs, spoken word, murals, and other 2-D and 3-D formats. •The proposed public art / creative advocacy project. •How the proposed public art / creative advocacy project will benefit the community-at-large. •How, if selected as the winning presenter, the event proceeds from FEAST will be used for the proposed project. After the presentations, attendees at the FEAST will vote on their favorite proposal. The winning presenter(s) will be awarded a portion of the proceeds from the event to support their proposed project (appx. $700-$1000). Winning presenter(s) will also be provided with an opportunity to collaborate with Studio HCM to utilize their photo, video, and audio recording rental space and equipment to assist in the production and promotion of their proposed project. •Description of proposed project (700 words or less). •Description of how their proposal will positively impact the community (100 words or less). •Evidence of past work (can send either website link, or work examples under 4 MB). Artists will informed by Wednesday, April 17th if they have been chosen to present at the April 27th FEAST. Submissions will be chosen on the creativity of their proposals, and impact on the community-at-large. The more details artists can provide about their proposed project, the better. Please send any inquiries to hawaiifeasting@gmail.com. Hawaiʻi FEAST is an event platform that supports place-based and public artwork through community financing and social networks. FEAST empowers artists to create a sense of place within their communities through creative expression. FEAST is built solely upon community resources; Local artists produce ideas for public artwork and community members take part in the decision making process of selecting projects and financing these projects. Learn more about FEAST by clicking here. The 2019 Honolulu Biennial – running from March 8 to May 5, 2019 – is an international contemporary art exhibition that brings together artists from Hawaiʻi, the Pacific, Asia and the Americas at ten locations throughout Honolulu. It will explore contemporary art connected by the Pacific from 47 artists and art collectives, as well as public programing such as art-making workshops, artist talks, dance performances, films, fashion shows, and live music. Find more information about the 2019 Honolulu Biennial by clicking here. Studio HCM is Honolulu’s first shared-space dedicated to multimedia rental.They offer photo and video production studio space, as well as lightning equipment, backdrops, accessories, and staff to support your project – just bring your own camera! Find more information about Studio HCM by clicking here.